Those of you who have been reading for a long, lonnnng time might remember that the first crafty thing I ever blogged about was a diaper cake I made for my friend Kim. This was years before Pinterest – I only knew about diaper cakes because I’d received one a few months earlier to celebrate Madeline’s birth. It was the first time I’d thought to myself, “I could do that,” and actually followed through. Because they are a) easy to make and b) impressive-looking, diaper cakes became my go-to baby shower gift for a few years. I decided diaper cakes would make good centerpieces for the tables at my cousin’s shower, and I thought I’d show you all how I make them! ~Baby gear – I use a mix of toys, baby socks, teethers, spoons, onesies, etc. I start by taping a used paper towel roll to the center of a cardboard cake round. Then I arrange the diapers in a fan around the paper towel roll. I used size one diapers on the base of my cakes, and it took about 27 diapers to fill out the bottom. I know a lot of people roll their diapers to make diaper cakes, but that makes it hard to use the diapers later (they lose their shape and are hard to store – I know this from experience!). I like to keep the diapers flat and fan them out to keep things easier for the new parents. I tie a piece of yarn or sheer ribbon to secure the diapers onto the cake stand. I tie the string tight enough to make sure nothing will slip out of place, but loose enough to allow me to tuck little baby items like socks and onesies into the spaces between the diapers. When I’m giving a diaper cake as a gift, I make three layers. The second layer is constructed exactly like the first, but with about 17-18 diapers. Since I was making five cakes to go on the shower tables, I just made these two layers high. The top layer is made by wrapping the diapers around the paper towel roll – I use six newborn-size diapers for this layer. I tie the top layer tighter than the lower layers to make everything below it extra-secure. If there is any excess paper towel roll coming out of the top, trim it off with scissors. Next, I cover the yarn with colored ribbon. I think that 2-inch ribbon works best for this – I only used one-inch ribbon for these cakes because there was a better selection of colors in this size at my craft store. I coordinated the ribbon colors based on Star Wars characters, but in the past I’ve tried to match the colors used in the baby’s nursery. I just use regular scotch tape to secure the colored ribbon! Now the fun part – decorating! This is a great way to use some of the smaller items a friend might register for! …wash cloths, onesies, pacifiers, and teething toys. I pulled out a diaper every now and then to make the wash cloths and onesies fit better into the cake. 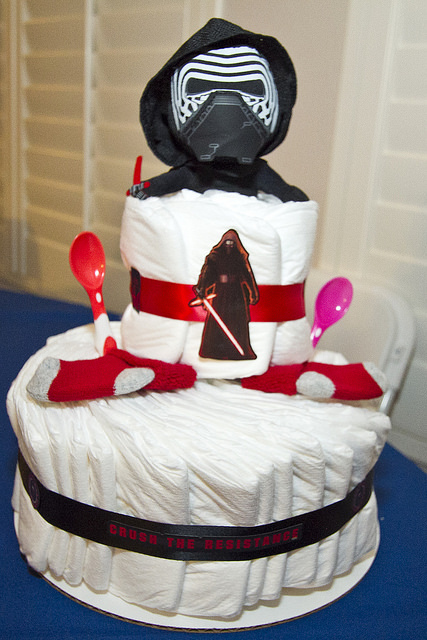 I stuffed a small Star Wars toy into the top of each cake. A small lovey or plushie would look adorable here, too! The best part is these cakes look labor-intensive, but they aren’t! I made all five in an hour. 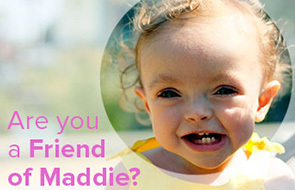 The parents-to-be will LOVE them and make you the godparent and probably even name their baby after you. Would you happen to have any idea of a diaper cake equivalent for the cloth diapering mom? I think diaper cakes are cute but I come from a large cloth diapering family and I know I will be going to many future baby showers where I want to give something cute, like a diaper cake, but something the mom will actually use. I just spent $10 on 50 diapers last night because I forgot the diaper bag (mommy fail) I’m giving away 49 because my dd is sensitive to them and turns red everywhere the diaper touches every time she wears disposables. I don’t want that to happen to anyone who gives a cute, well thought out gift for it to not be appreciated/goes to waste. 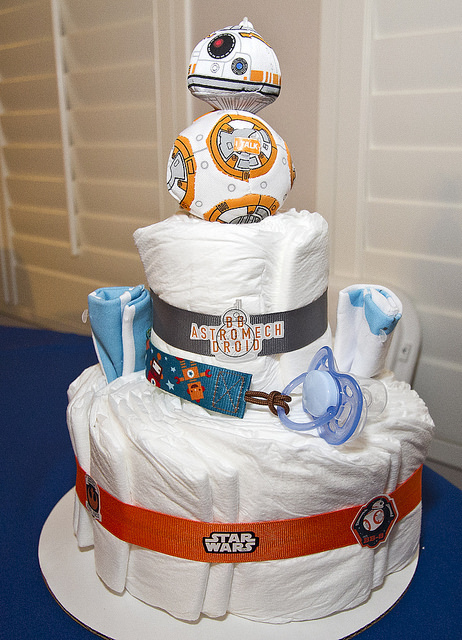 I also want to have an alternative idea for my sweet mil for any future babies I have because I know she loves to make diaper cakes and she was a bit sad she couldn’t make one for her first grandkid. I hope I inspire you for a future tutorial! Hmmm…maybe you could roll up the cloth inserts? Or do a combo of inserts/wash cloths/towels/onesies? I had a friend who cloth diapered but she still asked for 7th generation disposables for emergencies, so I made her a cake out of those! I’ll have to see if any of my cloth friends have ideas. I’m going to try this for a baby shower at work this weekend. I received one and the person used tape and it really ruined the integrity of some of the diapers but this is a great idea. I’ve been out if the baby world for a while so is there a particular brand of diaper that works better or you’ve found easier to work with? Nope! I just try to buy the diapers that have no designs on them. This time I used Target-brand diapers, but I’ve used Pampers in the past as well! Great idea, I’ve seen them but didn’t know how to make it. Thanks! And I REALLY want your shirt! Where did you find it????? Well done. They look awesome. I love that I can say that I got your first ever diaper cake! Seriously the cutest baby gift ever. Love ya!